Once in a while, one of the CelebrationKim family members finds herself on an FTF run wearing inappropriate caching footwear. At least the heels give her the extra height she needs for those hard to reach caches! We will be bringing this new tag to Geowoodstock XI! 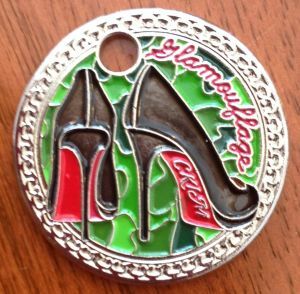 Thanks to Pink Sweets Pathtag Designs for turning our idea into a beautiful custom tag. NOTE: This tag has the honor of being the first ever in the gallery designed by Pink Sweets.